Stumped by dairy menu planning for the 9 days? Dairy Made Easy is here to help. During the nine days of mourning prior to the fast day of Tishah B’Av, it is traditional to abstain from eating meat and chicken. It can be a challenge to cook vegetarian for over a week, but with Dairy Made Easy, this task is easier than you think! Dairy Made Easy by Leah Schapira and Victoria Dwek showcases over 60 dairy recipes, from breakfast favorites like cheese pancakes to suppertime classics like pizza and pasta. Here’s an easy and family friendly recipe to put on your menu: Creamy Cajun Penne. Click here for more dairy recipes from the Made Easy cookbook series. Recipe from Dairy Made Easy by Leah Schapira and Victoria Dwek. Reproduced with permission from the copyright holders: ArtScroll/Mesorah Publications LTD. Meanwhile, prepare the sauce: Melt butter in a sauté pan over medium heat. Add tomatoes and sauté over high heat for 4-5 minutes. Add paprika, chili powder, cayenne pepper, and garlic powder. Add scallions and heavy cream; cook an additional 3-4 minutes. Add pasta to cream, a little at a time, and toss to coat. Season with salt and pepper. Enjoyed this post? Please share it using any of the sharing options below! On Tuesday we fasted for Shivah Assar B’Tammuz, marking the beginning of saddest weeks of the Jewish calendar. During the three weeks, and leading up to Tisha B’av, we mourn the destruction of Jerusalem and the Bais Hamikdash, the holy Temple, and our current exile in galus. Our sages teach us the importance of feeling a deep longing for for mashiach and the days of redemption. But achieving that seep inner longing is much easier said than done. How does one go about feeling that burning desire in the depths of their heart? How does one really learn to feel that yearning? 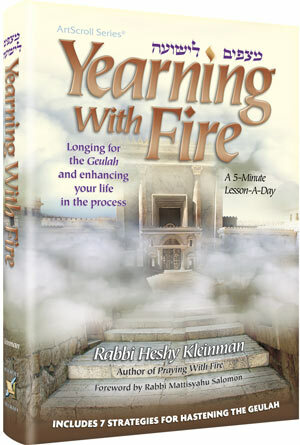 The answers lie within Yearning With Fire by Rabbi Heshy Kleinman, author of the best-selling and revolutionary Praying With Fire books.The deep insights and inspirational messages surrounding this important topic are broken down into daily learning segments. In just five minutes each day, you can change your outlook on life, and approach this Tisha B’av with the proper thoughts and feelings about galus and geulah. To help you prepare for the nine days and tisha b’av, we’re offering you a sampler download of Yearning With Fire. Download it. Print it. Learn it. Be inspired! And of course, please tell your friends about this valuable resource available from ArtScroll: every Thursday we offer an inspirational Torah download, related to the weekly parasha or other timely topics.